Located on the third-largest lake in Europe, Konstanz is the largest city on Lake Constance (known as Bodensee in German). 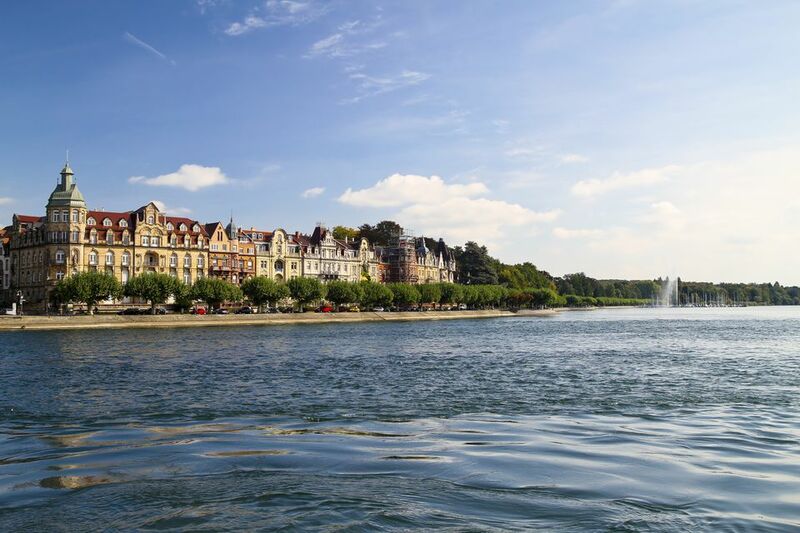 It is one of the lucky cities to survive World War II intact and features charming architecture and attractions, all within sight of the water. There is a Mediterranean vibe to this German city and you could be forgiven for spending your time like you are at the beach. The history of Konstanz is over 1,000 years old and many of the buildings in its Old Town, known of Niederburg, have the dates of their construction elegantly marked across their facade. Konstanz is one of the best-preserved medieval towns in Germany because during World War II the Allies avoided bombing it as it was too close to neutral Kreuzlingen in Switzerland. Walk through quiet cobblestone alleys extending north from the Münster (cathedral) all the way to the river Rhine. At the heart of this district is the Marktstätte (marketplace). Here you will find the Kaiserbrunnen (imperial fountain) with four former emperors, a three-headed peacock with each head regally crowned, as well as a bronze horse. While the street is lined with restaurants and cafes, every first Friday of the month from May to October, the party makes it outside. Gassen-Freitag features live music, street food, drinks, and even a traditional flea market. Behind the square is the Konzilgebäude (council hall) which was erected in 1388 as a warehouse. Now a concert hall, statues of locals Jan Hus and Count Ferdinand von Zeppelin stand beside it. Also in the area is the beautifully frescoed 15th-century Hohenzollernhaus, 16th-century Rathaus (city hall) and the Haus zum Rosgarten, once a medieval butchers' guild and now a museum for the region. Like every town on Bodensee, Konstanz centers on the harbor. The promenade starts at the Rhine bridge and follows the harbor. Stroll the palm-tree lined promenade with countless sidewalk cafes, historic townhouses, and buildings like the Kaufhaus (trading house) from 1388. Continue around the entire lake in this manner by taking the Bodensee-Rundwanderweg (Lake Constance Trail). This trail runs by numerous nature reserves like Wollmatinger Ried Untersee-Gnadensee. This reserve includes 600 different types of flora and nearly 300 bird species. The impressive statue of Imperia welcomes you to the harbor. Erected in 1993, it was controversial but has become a landmark of Konstanz. The satirical depiction is of a nine-meter-tall courtesan holding a pathetic Pope Martin V and Emperor Sigismund. It grandly rotates on its pedestal and refers to a short story by Balzac, La Belle Impéria. Once you have found your sea legs, take to the water. Boat tours regularly leave from mid-April to mid-October from Konstanz to Überlingen to Kreuzlingen to Lindau. The majestic Konstanz münster (cathedral) was the church of the diocese of Konstanz until 1821. First mentioned in 615 C.E. and consecrated in 1089 C.E., it features Romanesque and Gothic design as it has been updated to reflect the current style several times. Its spire pokes high into the sky and can be seen throughout the city. Stop before you enter the cathedral to admire the glass pyramid that protects the Römersiedlung. This is the remains of a Roman fort, Constantia. This original establishment gave the city its name. While you can get a glimpse from this elevation, full tours are available from the tourist office for a modest fee. Inside, the Romanesque painted wood ceiling from 1637, 15th-century schnegg (spiral staircase) and central doorway, and a thousand-year-old crypt are of particular importance. Or if you want to look down from heaven, climb the tower and gaze at the city and Lake Constance. Konstanz is home to prehistoric pile-dwellings (also known as stilt houses). These ancient settlements found around the Alps are a designated UNESCO World Heritage Site. Dating from around 5,000 to 500 B.C.E., there are 111 of these sites in all, with 18 in Germany. Excavations led to findings from as far back as the Neolithic and Bronze Age. Though these primitive houses now stand over water, they were initially on stilts in merely marshy areas. But over time, the land lost way to water, and they are now picturesquely positioned over the lake. Visitors can admire the houses and learn more about the history at Pfahlbaumuseum Unteruhldingen (German Stilthouse Museum). Opened in 1922, this open-air museum has reconstructions of the homes and buildings and a guided tour that explains what life was once like for the farmers, fishers, and families that called the area home. There are also activities for the littlest museum-goers like ax-making and fire-starting. Just off the shore of Konstanz are three islands well worth a visit. The 110-acre garden island of Mainau is renowned for its carpets of flowers and greenhouses. It has nearly 10,000 rose bushes, thousands of butterflies, and a 13th-century baroque palace. It is unquestionably beautiful and one of the most visited sites in the area with over two million visitors every year. Visitors can make it to the island by boat or via a pedestrian bridge. The island is open every day from sunrise to sunset, but an entrance fee is required. To the west of the city is Reichenau Island. Preserved on the island is the remains of a Benedictine monastery from 724 C.E. The churches of St. Mary and Marcus, St. Peter and St. Paul, and St. George illustrate medieval monastic architecture with impressive wall paintings. On the other side of the lake is Lindau. It also has a magnificent harbor guarded by a Bavarian lion and lighthouse. On the island, the town is full of medieval half-timbered buildings. If you visit Konztanz during the wine harvest in fall, there is sure to be a party. The annual weinfest (wine festival) in Meersburg and Komm und See summer wine festival is a great way to mix with locals and share their love of the vine. Sample the best wine in the region such as Müller-Thurgau, Dornfelder and Pinot noir (blauburgunder) grape varieties which all thrive here. Also don't miss regional specialties like dünnele, a thin pizza traditionally topped with speck (bacon), frischkäse, and onions. Or take advantage of the lake with an order of whitefish. If you miss the festivals, you can still enjoy a glass or two beside the lake any time of the year. Only three of the city's towers are left of Konstanz's medieval fortifications. Finding all three makes for a lovely walk from the Rhine river to the northern end of the old town. Pulverturm was built in 1321 by the Jewish citizens of Konstanz. Squat and sturdy, its walls are two meters thick. Rheintorturm is on the River Rhine and was a bridge gate. Now it is the site for the Constance Carnival Museum. Always a big celebration, the museum allows visitors to enjoy the party year-round with 40 life-sized carnival figures. Look for this tower's distinctive red pyramid-shaped roof. Schnetztor is on the southern side of the old town on Hussenstraße and is pictured here. Germans take relaxing very seriously, and spa culture is a serious thing. Even though life on the lake seems pretty idyllic, the good people of Konstanz still take plenty of time to chill. Bodensee-Therme Konstanz is the thermal spa for Lake Constance and is right on the water. There is a 50-meter open-air pool with slides to please children and adults (open in summer), and access to Lake Constance. In winter, leave the icy outdoors for the warm thermal baths (open year-round). There are three saunas, steam bath, sanitarium, plunge pool, and relaxation room with refreshments. Count Ferdinand von Zepplin's hometown of Friedrichshafen is just across the water. It is well worth a visit, especially as it is the site of the Zeppelin Museum. Built in 1932, the museum covers everything zepplin and features a recreated section of the Hindenburg, the largest airship ever built and subject of the 1937 tragedy. The museum also holds an impressive art collection on the top floor. If exploring the zepplin's history has whet your appetite for flying, book a spot aboard an air ship. Zepplins reach a cruising altitude of 1,000 feet and provide the best views of Lake Constance and the surrounding area. Passengers can walk around the ship and enjoy views from every direction. The low flying altitude allow passengers to clearly identify the gorgeous landscape of castles, mountains and lakefront below. Several routes are available starting at 20 minutes all the way to 120 minutes.